Anthony Boucher was much better known as a critic but in the late 30s and early 40s he wrote a handful of very well-regarded detective novels. The most famous is perhaps The Case of the Baker Street Irregulars, published in 1940. The title would lead the reader to expect a Sherlock Holmes pastiche but this book is actually something very different, and far more interesting. This is a Holmesian puzzle but not only does Sherlock Holmes not appear in the book, there is also no Sherlock Holmes imitation or clone or anything along those lines in the story. It’s actually a novel about Sherlock Holmes fans. In fact it’s perhaps the earliest detective novel that takes fandom as its subject matter. 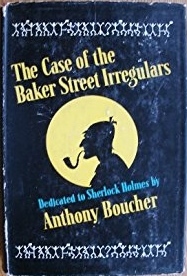 The Baker Street Irregulars was (and still is) in real life a kind of club composed of mostly literary figures united by their obsession with the Sherlock Holmes stories. Metropolis Pictures is about to make a film adaptation of Sir Arthur Conan Doyle’s The Speckled Band. Metropolis Pictures is a typical Hollywood studio run by a typical Hollywood mogul, F.X. Weinberg. Weinberg is a man who proudly wears his vulgarity on his sleeve. Any chance that the film will be a faithful adaptation went out the window when Stephen Worth was assigned to write the screenplay. You see Stephen Worth is a hardboiled crime writer who despises the Sherlock Holmes stories and despises Sherlock Holmes fans, especially the Baker Street Irregulars. Worth intends to write a screenplay that will be a merciless mockery of Conan Doyle’s creation. Even a man as crass as F.X. Weinberg can see that this could cause problems. It could cause problems that would hurt the picture at the box office. He wants to fire Stephen Worth from the picture but Worth has an air-tight contract - if Weinberg wants the picture made Worth has to be the screenwriter. Weinberg’s solution is to hire five prominent Baker Street Irregulars to act as technical advisers to make sure the movie is properly Sherlockian. The combination of Worth and the Baker Street Irregulars is guaranteed to lead to fiery confrontations. In fact it quickly leads to murder. The police are faced with a major problem - there was definitely a murder but there’s definitely no body. At this point the novel starts to become slightly surreal. The day after the murder the five Baker Street Irregulars all have extremely bizarre adventures and these adventures are all eerily reminiscent of various Conan Doyle Sherlock Holmes stories. In fact the whole case becomes more and more a tangle of Sherlockian references and Sherlockian clues. It has to be said that Boucher handles this with great dexterity and ingenuity. The main plot has plenty of suspects, lots of alibis and lots of twists. And there are floor plans, and diagrams, always a major plus in my view. If there’s a weakness it’s the political angle which becomes a bit tedious. OK, Nazis were very topical in 1940 but today they get boring rather quickly. Boucher was nothing if not ambitious since he also throws in a romantic sub-plot. This is something I mostly disapprove of in golden age detective stories but this one is handled pretty well, and more importantly the author manages the difficult feat of not allowing the romance to slow down the plot. If you love codes and ciphers then you'll be overjoyed to learn that there are a whole swag of them in this story. This is a book that is probably not capable of being appreciated by readers who don’t have at least some acquaintance with Conan Doyle’s stories. Such readers are going to miss all the in-jokes and all the wit and will probably find the book to be mystifying, but mystifying in a bad way. On the other hand if you’re a Sherlock Holmes fan you’re likely to find the whole thing to be very enjoyable indeed. On the whole I liked it and it’s clever enough and original enough to be regarded as a substantial achievement. So for Sherlock Holmes fans, highly recommended. For non-Sherlock Holmes fans, possibly one to avoid. Roger Sherman Hoar (1887-1963) was a prominent Massachusetts politician who wrote a considerable amount of science fiction under the name Ralph Milne Farley. His biggest success was the Radio Man series. 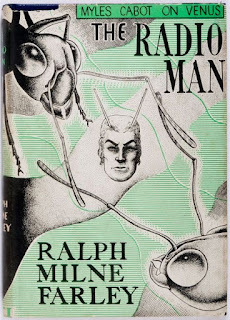 The first novel in this series, The Radio Man, was written in 1924 (it was later re-issued in paperback by Avon as An Earthman on Venus). 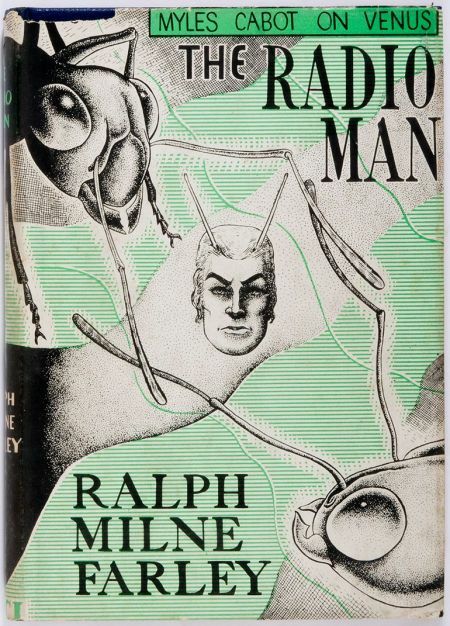 The Radio Man starts off in a manner rather reminiscent of Edgar Rice Burroughs, with the narrator receiving a very surprising message from outer space. The message purports to come from a certain Myles Cabot, a radio engineer who vanished several years earlier. The narrator is convinced that the message is genuine. The message from Cabot tells his story since his disappearance. Cabot has been experimenting with the use of radio for the purposes of matter transference. The experiment goes wrong and Cabot is transported to Venus. Venus is partly habitable. Civilisation is confined to the central continent which is surrounded by the Boiling Sea, a quite impassable obstacle. Cabot awakens to find himself in a civilisation of human-sized ant-men. He recognises them as being obvious intelligent and they come to the conclusion that he is also a creature possessed of intelligence and reason but initially there seems to be no possibility of communication. Cabot’s scientific background and his work in radio now proves to be crucial, allowing him to save the communication problem. There are two intelligent species on Venus, the ant-men (the Formians) and a human-like but not quite human species known as the Cupians. The Formians are the dominant civilisation. The Cupians are not exactly slaves but they politically subject to the Formians. Cabot is caught up in various political intrigues involving a beautiful Cupian princess. Cabot makes enemies among both Formians and Cupians but he finds allies among both sides as well. Given that the Formians are an ant society and the book was written in 1924 you might be forgiven for thinking that they represent the Bolsheviks but The Radio Man doesn’t really seem to have any particular political axe to grind. The Formians are somewhat socialistic and militaristic and they do oppress the Cupians but they’re not evil by any means. In some ways they’re quite enlightened and humane while in other respects their society is rigid and mechanical. Their political oppression of the Cupians is exceptionally mild. The Cupians are a monarchy and their society has both strengths and weaknesses as well. There are noble and kindly Formians and villainous ones as well, and there are Cupians who are treacherous and cruel and others who display nobility and kindness. There’s an obvious Edgar Rice Burroughs feel but there’s a definite Mark Twain influence as well (the Mark Twain of A Connecticut Yankee in King Arthur’s Court). There’s also a touch of The Prisoner of Zenda with Cabot getting mixed up in Cupian palace intrigues. Farley does not quite succeed in making the Formians convincingly alien. Despite having a society based on ant society they’re a bit too human in their thinking and their emotions. Farley misses the obvious opportunity to examine the nature of the hive mind of an insect society. Farley also seems uninterested in using his story as the basis for a political satire. On the plus side this is quite an entertaining adventure tale and the ways that Cabot uses his expertise in radio technology to extricate himself from the many scrapes he gets himself into are quite clever. Apart from being a politician the author was a noted patents attorney and his interests in both inventions and the law are put to good use. This is a fairly light-hearted adventure romance romp. It’s certainly not in the same class as the planetary romances of Burroughs but it’s quite enjoyable. It’s worth a look. 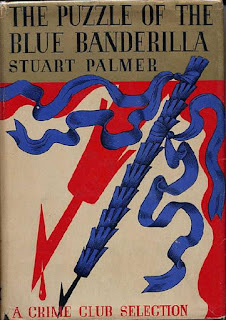 The Puzzle of the Blue Banderilla appeared in 1937, being the seventh of Stuart Palmer’s Hildegarde Withers mysteries. This being my first Hildegarde Withers book I’m a little vague on the backstory of the two main characters but clearly middle-aged spinster schoolteacher Hildegarde Withers is in the habit of helping out hardbitten New York cop Inspector Oscar Piper on some of his more challenging murder cases. The Inspector has scored himself what promises to be a pleasant little junket down Mexico way. The reason he scored the junket sheds some interesting light on the way things were done back in the 30s. Piper seems to be a perfectly honest cop but he’s been happy to go along with the rather shady shenanigans of New York’s political bosses and now he’s getting his reward. It’s taken for granted that all branches of government are basically corrupt and if you want to have a career you don’t make waves. This is an intriguing bit of what would normally be considered to be hardboiled content in what is otherwise a very light-hearted tale. The train trip to Mexico City is not overly comfortable but it’s fairly uneventful, apart from the occasional murder. This is a slightly odd murder. Why would anyone want to murder a Mexican customs officer, and why murder him in such a manner? Poison in a perfume bottle is a strange way to bump off a customs official. And what connection could there be between such a murder and the youngish wife of a New York alderman? Yet the connection is undeniable. Oscar Piper is well acquainted with the alderman in question, a notoriously corrupt city official. Oscar is puzzled and there follows a frantic exchange of telegrams between the Inspector and Miss Hildegarde Withers, an exchange that becomes more urgent as Miss Withers quickly becomes convinced that Oscar is on the wrong track entirely. The good Inspector’s approach to crime-solving seems to be to pick the most obvious suspect and then have them arrested, the matter of finding any actual evidence being apparently of little importance. It’s just as well that Miss Withers hops aboard the first plane to Mexico City, just in time to bail Inspector Oscar Piper out of gaol. The murder will later strike again, in equally puzzling circumstances. Palmer’s still is breezy and energetic. Oscar Piper is an engaging and amusing character even if he appears to have certain worrying deficiencies as a detective. Miss Withers is your classic middle-aged spinster genius amateur detective, a type of which I’m not overly fond. There’s plenty of humour but it doesn’t overwhelm the story which never threatens to descend into silliness or contrived whimsy. The humour flows naturally from the characters and the situations. It’s not laugh-out-loud funny but it is gently amusing. The plot has a few clever touches and there’s an abundance of red herrings but the central mystery is not overly brilliant. Some of the important plot elements are all too obvious. Palmer makes up for this to some extent by keeping the action moving along at a fairly frenetic pace. Palmer had already started writing screenplays by this point and to my mind the novel is rather cinematic (and I mean that as a compliment). The complex set-piece involving the bullfight is adroitly executed and would have been the ideal centre-piece for a film adaptation. This is perhaps not quite an impossible crime story but one of the murders is certainly superficially difficult to explain. Solving the mystery of how it was committed is a key plot point but unfortunately the explanation is quite straightforward - it certainly lacks the dazzling ingenuity that a John Dickson Carr would have put into such a puzzle. Oscar Piper is a remarkably clueless policeman. The Mexican police are considerably more intelligent and more professional although of course even they cannot solve the mystery with Hildegarde Withers. Miss Withers herself is not as irritating as I’d expected her to be. She’s eccentric but Palmer wisely doesn’t push her eccentricities too far. So did I enjoy this novel? Yes, it’s a good-humoured and well-told tale even if the mystery is a little on the weak side. Would I read any more Hildegarde Withers mysteries? To be honest, probably not. Would I recommend it? Probably, to those who like middle-aged spinster genius amateur detectives and lightweight comic-tinged detective stories. 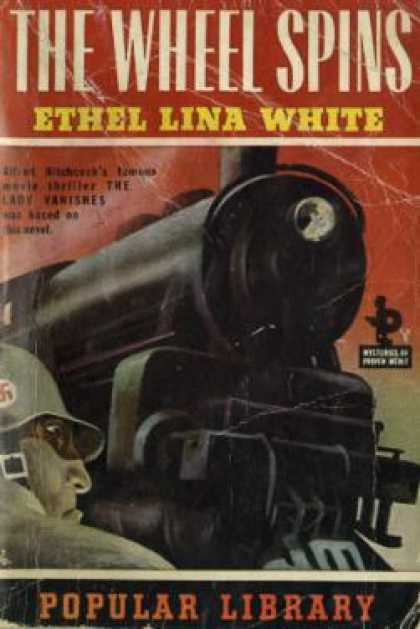 Ethel Lina White (1876-1944) was a popular British crime writer who would now be entirely forgotten but for the fact that two of her novels were made into extremely good movies. 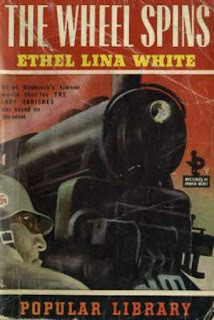 Her 1936 novel The Wheel Spins was filmed by Alfred Hitchcock as The Lady Vanishes while her 1933 novel Some Must Watch was filmed by Robert Siodmak as The Spiral Staircase. It is The Wheel Spins with which we are concerned at the moment. White seems to belong to the dreaded Had I But Known school of crime fiction. In this case, given that the book is narrated in the third person, it’s more of a Had She But Known story. It’s also more of a suspense novel although with some detective story elements. The heroine is a very rich and very unpleasant young woman named Iris. Iris and her friends are holidaying in an unnamed central European country and they are displaying their usual mix of boorishness, pretension and shallowness. It’s clever to display rudeness and cruelty because all the smart people do so. In the 20s Iris’s crowd would have been known as Bright Young Things. The early part of the book tells us far more than we wish to know about Iris and about the motley collection of English guests staying in a hotel in the mountains. We assume that these people are all going to be passengers on the train which is to be the novel’s main setting. In fact they will be passengers on that train but mostly they don’t play much of a role in the story. This introductory section of the book also gives White the opportunity to throw in lots of Had I But Knowns. The season is almost at an end and the English visitors are about to head back to England. Iris has an odd experience at the railway station, an experience which is put down to a touch of sunstroke. On the train she encounters an English spinster, a Miss Froy. Miss Froy then vanishes. Vanishes into thin air. The view of the other passengers, and the railway employees, is that there never was a Miss Froy. After a while Iris has her doubts as well. If Miss Froy existed then the mystery of her disappearance can only be explained by a vast and elaborate conspiracy theory, which just doesn’t seem possible. Iris’s big problem is that nobody will believe her. Even her one ally, an amiable young English linguist, doesn’t believe her. The basic story idea is good but the execution is very disappointing indeed. White does not really seem to know how to maintain suspense. Her pacing is poor and she is inclined to reveal too much information too soon. She spends too much time on unimportant peripheral characters and irrelevant sub-plots. She has a tendency towards sentimentality. Most of all she seems to lack the ability to structure a suspense story. There’s a romance here. I am one of those people who dislikes romance in mystery novels but I have no problem with a romance element in a thriller. The difficulty in this book is that the romance is unconvincing and worst of all it just isn’t very romantic. White obviously wanted to focus quite a bit on Iris’s character flaws and the ways in which she learns to overcome at least some of them and transform herself from an unsympathetic and very flawed protagonist into a reasonably sympathetic and rather less flawed heroine. This is actually a worthwhile idea and it does succeed to a certain extent. With all its flaws there is as I said a story idea with potential and it’s easy to see why Alfred Hitchcock saw that potential. Fortunately he had the services of two very competent screenwriters, Sidney Gilliat and Frank Launder, and they were able to eliminate most of the novel’s flaws. Hitchcock also had a fine cast and characters who were tedious in the novel become quite entertaining in the movie. The screenplay made some significant plot changes, all of which were beneficial. Hitchcock’s film is a masterpiece of suspense and it’s also great fun. White’s novel is a bit of a mess and it’s rather lacking in fun. If you’re a fan of Hitchcock in general and The Lady Vanishes in particular then The Wheel Spins will be of some interest. It’s actually a textbook example of the ways in which good screenwriters and good directors can produce great results working from mediocre source materials. If you’re not a fan of the movie there’s really no pressing reason to seek out this book. In 1894, having finished (as he thought) with Sherlock Holmes, Sir Arthur Conan Doyle had to find some sort of replacement. He still had a living to make as a writer and he was now very much in demand. The Strand Magazine wanted more short stories. A new series character was needed. Conan Doyle came up with one, a character who was very different indeed from Sherlock Holmes. At the end of 1894 the first of his Brigadier Gerard stories appeared in the Strand Magazine. 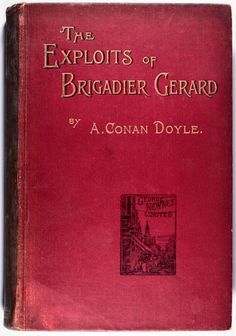 In 1896 the Gerard stories were published in book form, as The Exploits of Brigadier Gerard (a second collection would follow in 1903). Conan Doyle was very enthusiastic about his historical fiction, considering it to be his best work. He may well have been right. His medieval adventure novel The White Company is one of the classics of the genre. The Gerard stories differ in tone from his medieval stories but they are every bit as good. Etienne Gerard is a dashing hussar officer in Napoleon’s Grand Army. The stories are narrated in the first person and it is immediately apparent that Gerard has a very high opinion of himself. He is in fact a very brave officer, a skillful horseman and a fine swordsman. He is conscientious and keen. He is unfortunately a man of strictly mediocre intelligence and very limited imagination. His greatest fault is his absurd over-confidence. His faith in his own judgment is unlimited, and sadly misplaced. The Emperor himself has described Gerard as having the thickest head but the stoutest heart in his army. A conceited dimwit could have been a rather unattractive character but Gerard is someone we cannot help liking. He means well and he tries so hard. Mostly though it’s his total lack of self-awareness that makes him so endearing. The Gerard stories may well have been part of the inspiration for George MacDonald Fraser’s Flashman novels. That might seem like an odd claim since Flashman and Gerard are very different types of men. Both sets of stories do have one major thing in common though, a kind of mock-heroic tone. Both Flashman and Gerard appear to the world to be the very quintessence of the hero, but in both cases it’s an illusion. Flashman is actually a bully, a coward and a cad. If he does anything heroic it is quite by accident. Gerard is an honourable and gallant soldier but the combination of his limited intelligence and his ludicrous over-confidence makes him a slightly dubious asset to Napoleon’s army. Like Flashman he is more likely to commit his feats of heroism, by blundering into them. There is another similarity between the two characters. Both have an enormous liking for the ladies. Both are in fact breathtakingly promiscuous although of course Conan Doyle is somewhat coy about describing Gerard’s conquests in detail (and it is possible that Gerard’s vast ego has inflated his success with the ladies somewhat). The other quality that the Gerard stories and the Flashman stories have in common is that they are extraordinarily enjoyable. Conan Doyle took historical fiction seriously but he never made the mistake of thinking that good writing does not need to be entertaining. Blending humour with action is quite a tricky balancing act. The humour cannot just be a gratuitous addition. It must flow naturally from the story. In this case Brigadier Gerard, our narrator, believes he is simply recounting his adventures and his amazing feats of heroism. He is not trying to be amusing. The humour comes from his own absurdities of which Gerard remains blissfully unaware. At the same time Conan Doyle cannot allow Gerard to become too ridiculous. We must be able to admire his very genuine daring and courage and his formidable determination. It’s a balancing act that Conan Doyle manages with superb skill. The Medal of Brigadier Gerard was the first of the Gerard stories to appear in the Strand Magazine. It is 1814 and Napoleon is fighting desperately to save what is left of his empire. He is hopelessly outnumbered but he has devised a plan which may yet save the day. It is essential that the details of the plan should reach Paris as soon as possible. Two brave officers are selected for this dangerous mission. To ensure that at least one copy of the message gets through they will follow different routes. One of the two officers is Brigadier Gerard. Gerard understands the vital importance of his mission. Except that he doesn’t understand at all, which is what makes the story so clever and entertaining. In How the Brigadier Held the King it is 1810 and Gerard, at this point a very young colonel of hussars, is serving with the Emperor’s forces in Spain. He has an unfortunate encounter with Spanish guerillas, an encounter that has the potential to be not merely fatal but fatal in a particularly unpleasant way. It is a situation that demands coolness, subtle intelligence and fine judgment. Gerard possesses none of these qualities, but luckily he is a skilled card player. This story also marks Gerard’s first encounter with British officers and there is a good deal of amusement to be derived from Gerard’s extraordinary capacity for entirely misunderstanding everything to do with English life, culture and social habits. How the King Held the Brigadier tells the story of Gerard’s period as a prisoner-of-war at Dartmoor. He is determined to escape but as usual, despite his boldness and courage, his plans go disastrously awry. his one is great fun. 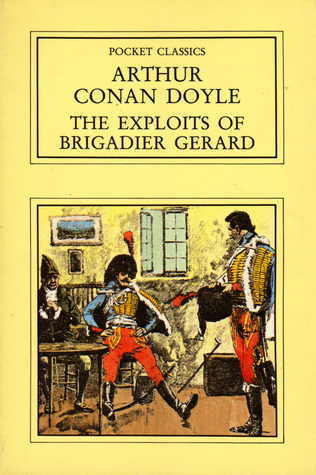 The excellent How the Brigadier Slew the Brothers of Ajaccio is one of several stories in which Gerard undertakes a secret mission on the Emperor’s personal instructions. It is 1807, Gerard is a young lieutenant, and the emperor’s past threatens to catch up to him. How the Brigadier Came to the Castle of Gloom shows us another side to Gerard. This time he is engaged in a purely private adventure and he will need to use his brains to get out of a particularly awkward predicament. This could be a problem since brains are not really Gerard’s strong point. We find however that although Gerard lacks imagination and intellectual subtlety he is not after all a complete fool. He does have perseverance, mental toughness, a certain amount of resourcefulness and is quite good when it comes to finding immediate practical solutions. We know that Gerard, despite his own fantasies on the matter, would have been a catastrophically incompetent general but as a junior officer he is reasonably efficient and effective. It adds some depth to the character to see him confronted by the sort of problem that demands the very qualities that he does possess. It’s also a wonderfully action-packed little story. How the Brigadier Took the Field Against the Marshal Millefleurs has Gerard hunting for a notorious brigand, a renegade English aristocrat. Gerard has a surprising ally this time - the captain of a troop of British dragoons. The brigand, known popularly as Marshal Millefleurs, has his headquarters in a very sturdy castle. This brigand also has the advantage of being both clever and unscrupulous, surely too clever for poor Gerard. But Gerard can be ruthless as well and he can show occasional flashes of very good sense. A fine stirring story. In How the Brigadier was Tempted by the Devil it is 1814 and the end has come for Napoleon, but the Emperor has hopes that perhaps one day he will have a chance to retrieve his throne, in which case there are certain papers that must be secured at all costs. Gerard and two other officers must ensure that those papers are safe. Not one of the stronger stories in the collection but still reasonably entertaining. In How the Brigadier Played for a Kingdom it is 1813 and events are turning against Napoleon. Gerard is caught up in a dangerous game with the highest possible stakes, the very survival of Napoleon’s empire. His opponent in this game is a beautiful and very clever woman. A more serious story and perhaps not a great Gerard story but it does provide a suitable conclusion to the first collection of Gerard stories. Each of these stories has a plot twist. The reader will see the twist coming. The reader is supposed to see it coming. The fun comes from the fact that not once does poor old Gerard see it coming. These are generally light-hearted rollicking tales of adventure very liberally laced with humour but they have the occasional grim moment - at times surprisingly grim. Conan Doyle was one of the grand masters of the genre. A couple of the stories are slightly weak but six of the eight stories are true classics of historical fiction as well as terrific swashbuckling adventure tales. The Exploits of Brigadier Gerard is superlative entertainment. Highly recommended.